In the Garden and More: Unprecidented Cedar Pollen~ Timely Again! Unprecidented Cedar Pollen~ Timely Again! Never Before Has Pollen Appeared in Such Abundance! The Cedars are pollinating and if one merely brushes by one, a pale yellow mist will swirl about the hapless wanderer. The Cedar is a determined tree, and the product of evolved survival tactics. A Cedar will grow in impossible conditions and each one will selfishly take any and all available water, leaving less aggressive trees to perish. With the drought, determined to survive, they began an unprecidented production of pollen. Cedars are also famous for the effects they have upon the human race, causing much misery as their pollen drifts through the air this time of year. The Cedar pollen is microscopic and can travel hundreds of miles on the wind. It has arrived here and is the cause of much of our current allergy suffering. With this ammount of pollen, which is obviously 'off the charts' there is a new malady called "Cedar Fever" which causes a true and severe illness, including respitory distress. The pictures below show clusters of the microscopic pollen... imagine how much may be tossed in the air! The Tree below appears to be dead, however the yellowing seen is pollen! 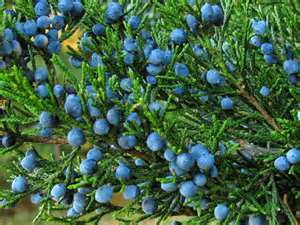 Once fertilized, the female trees become covered with small blue berries; each one is an infant Cedar tree. The birds find the berries delicious and the baby Cedars are spread through the bodies of the birds. The birds gorge themselves, fly to rest in leafy trees, and drop a Cedar ‘package’ of unprocessed berries to grow at the base of the tree. The aggressive adolescent Cedars surround and literally choke or starve any other species of tree, taking all water and nutrients from the soil for themselves. It is wise to make efforts to partially protect yourself from Cedar pollen based illnesses. Obviously the more time spent outdoors the more problems with allergies so do not invite pollen inside by opening doors and windows for fresh air on pretty days… there is no fresh air during Cedar season. Wash your hands after playing in the yard, wash hair before bed, and change your pillowcase daily. Take whatever medications necessary to relieve allergy symptoms and remember Cedar season does not last forever…. it just seems so.